But be honest, who saw tonight’s reveal coming? Quite the shocker! Let’s discuss and break down what happened. And I’m going to put a big SPOILER ALERT here for anyone who hasn’t yet watched the episode. Time to peace out until you’ve seen it. Curtis’ husband slapped him with divorce papers! Tonight’s big reveal was of course when we learned the identity of Prometheus is none other than Ollie’s trusted right-hand man, Adrian Chase! B-But wait…isn’t Adrian Chase supposed to be Vigilante?! I totally get it. That’s what we were all expecting, right? But hear me out a bit here as I make the case for why this is perfect. Because honestly, I dig everything about it. I think it’s perfect timing, with a solid amount of the season left to play with. Plus, I think it’s great that it’s a close friend to Oliver. Why did you decide to have Adrian be Prometheus rather than Vigilante like he is in the comics? Wendy Mericle: I think one of the reasons is probably because everybody would be thinking that he was going to be Vigilante. Adrian Chase is Vigilante in the comic books. We thought it would be a really fun sort of twist to do what we’ve always done on the show, which is to take the comic book mythology and turn it on its head and see what kind of story we can mine from a surprise like that. It was also just something different for this season. We wanted to change up how we introduced the “big bad” and change up when we did it, how we did it, and hopefully we succeeded in that this year. Oliver threw Adrian under the bus a little bit because in order to get the police off of the Green Arrow’s back, he had to admit that the mayor and the district attorney colluded in this kind of conspiracy. Is that going to inform the relationship between Oliver and Adrian going forward? WM: It’s an interesting take. I think in “The Sin-Eater,” we do see him basically acknowledging that he and Adrian colluded, but I think what’s interesting about that episode is that ultimately Oliver doesn’t throw Adrian under the bus. He takes it on the chin and he throws the Green Arrow under the bus. One of the things that we really liked about what we built is that Adrian is on his side and the bond between them has grown really strong. We hope that will create a much bigger impact on Oliver when he finds out down the road who Adrian really is, and that this is the guy who’s been really messing with him all season. Josh, you knew going into this role that you were playing Prometheus? 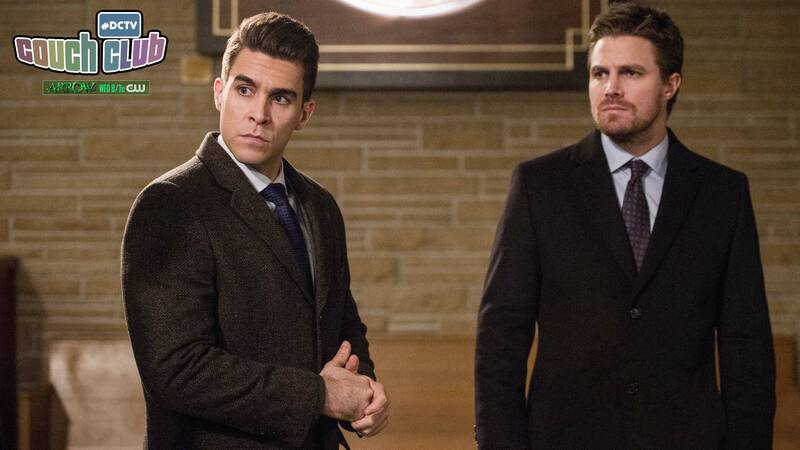 Josh Segarra: Well, it was kind of funny the way it all went down. I was home in New York, and I got on the phone with Wendy [Mericle] and Marc [Guggenheim]. To be honest, I thought I was just going to talk to them the way I’ve spoken to a couple directors or executive producers along the way. I’m going into it just thinking that they’re going to tell me what Vancouver is like, and they start talking to me about this character. They started talking about how I was going to be the “big bad” this season, and I was going to play this guy, and they described Prometheus to me. So I’m thinking that this is going to be pretty exciting. I’ll get to train and put different skill sets to use. But it was really just a casual conversation. Us just getting to know each other a little bit before we signed on to work on a future project. That was more of what that conversation was, but they mentioned Prometheus along the way. That’s when they tell me everything. So me and my wife, we moved over to Vancouver thinking one thing, and I learned once I got here who I actually was playing. That whole journey began at that one moment. I think I’ll always look back and laugh at that part of the story, realizing now who I actually got to be. And now we know the full extent of who that person really is!